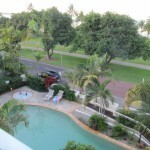 An escape from the Melbourne winter for two weeks in Cairns. The shock of coming from a balmy 27 ºC and stepping back onto the Tulla tarmac at 7 ºC was quite considerable! 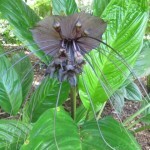 Spelling paddock highlights included the pleasant view from the balcony of our comfortable lodgings on The Esplanade; the black bat flower (Tacca chantrieri), a native to tropical SE Asia, at the botanical gardens; and the Tully gumboot. 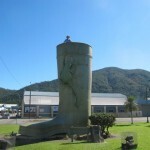 The height of the gumboot is equivalent to the highest annual rainfall of 7.83 metres in 1950. The most rainfall recorded in one 48-hour period was 1.32 metres in March 1967. A pretty wet place! I got home to find 36 millimetres in my rain gauge. A deluge! Nearly need my gumboots!